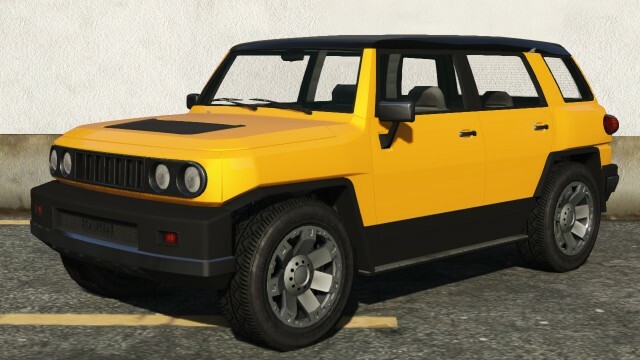 The Karin BeeJay XL is a 4-door SUV in GTA 5 and GTA Online. The BeeJay XL features a retro utilitarian design theme, which seems to be inspired by the Japanese styling found on the Toyota FJ Cruiser, but with a flatter, less aggressive appearance and regular second-row doors (as opposed to suicide doors). The rear bumper and fascia bears some resemblance to the 1st generation Toyota RAV4. The front grille and hood are loosely based on the Hummer H3. The sides of the BeeJay XL lack extra formations. The lower body is a different color to the upper body. The BeeJay XL features the same seven spoke wheels found on the Cavalcade, wrapped in high profile tires. The Karin BeeJay XL, like its real life counterpart, has a large 4 litre V6-engine which is capable of providing good top speed, however it leaves much to be desired from acceleration. Due to its heavy weight, some oversteer is noticeable, and because of this, caution must be taken when cornering at high speeds. It is also shown that it can sustain heavy amounts of damage. In terms of pick up and go the Karin Beejay XL is sub par in acceleration for an SUV but maintains the same level of speed from its competition such as the Bravado Gresley and the Declasse Granger. When traveling at high speeds there is a notable amount of traction loss compared to its counterparts, yet it seems to have stiffer suspension allowing the vehicle to grab a little more air than the rest. Frequently spawns in Blaine County rather than in Los Santos. Frequently spawns in Rockford Hills when switching to Michael during daytime. Jimmy De Santa’s BeeJay can be retrieved from Premium Deluxe Motorsport immediately after the mission Complications by Michael De Santa and stored in one of his garages. Found parked on the western shore of the Alamo Sea off Calafia Road, next to some tents and a Gallivanter Baller. Has a higher possibility of spawning in Los Santos city if the car is requested by Simeon Yetarian. 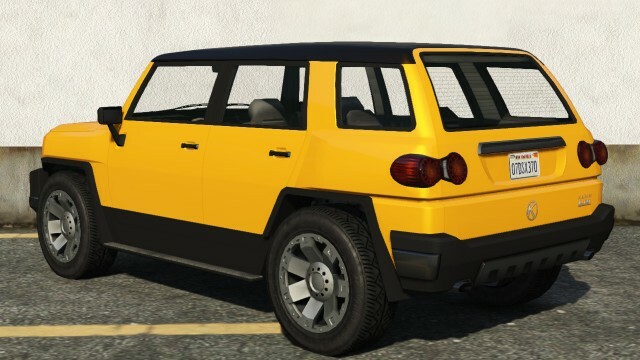 In GTA Online, Karin BeeJay XL sells for $2,700 in Los Santos Customs.